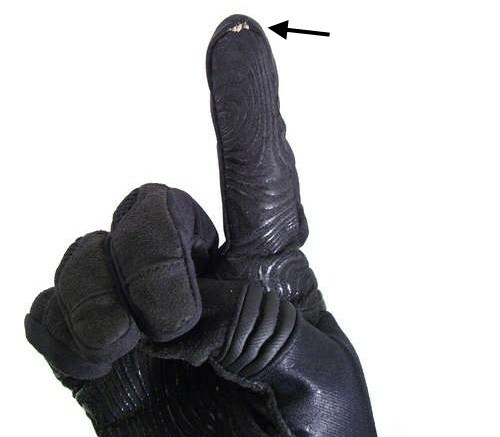 Use Conductive Thread To Make Your Gloves Touchscreen Friendly | OhGizmo! There are a number of phones out there with touchscreens, which under normal circumstances are great. However, once the weather turns cold and the gloves come on, these wonderful pieces of technology are rendered all but useless. If you wish to check your email, send texts or do anything other than stare at the screen you’ll need to have at least one finger exposed to the elements. That, or you simply need to be a crafty individual. Since most phone touchscreens require a conductive material (such as your skin) to work, your gloves aren’t going to register when you touch it. However, if have a conductive material that can touch both your skin and the screen at the same time it will work. Armed with this knowledge, you can sew a bit of conductive thread (yes, apparently they make conductive thread) in the tip of your glove’s index finger. You’ll then be able to go about your business as usual, with all fingers safely inside the confines of a glove. Why doesnt ohgizmo purchase a spool and give away 1 foot of it away to its readers who send in a SASE. Theres no way 1 person needs 1 whole spool which has 82 meters of conductive thread. How about you purchase a spool and we get it from you? May i spool you when you sleep instead? My touchscreen doesn't require conduction to work, so I'll save myself a stamp. It's good to see that people can still think their way around the problems that their phones have though. I like instructable, but I liked it better when I didn't have to buy a membership. That's pretty usefull, and makes you wonder why people have made finger less gloves before making this?